Beneavin College opened in 1962. It is a school in the De La Salle tradition sharing the mission of human and Christian education of young people. The Lasallian family was founded in Rheims, France in 1651 by John Baptist De La Salle who dedicated his life to education and became the Patron Saint of teachers in 1952. A De La Salle school is a community consisting of students, teachers, parents, ancillary staff and trustees. Today there are De La Salle schools in eighty different countries and more than sixty thousand teachers, parents and trustees work in partnership with over a million students. The Brothers have been working in Ireland for more than one hundred years and came to Finglas in 1956. Currently there are 22 Lasallian centres throughout Ireland. 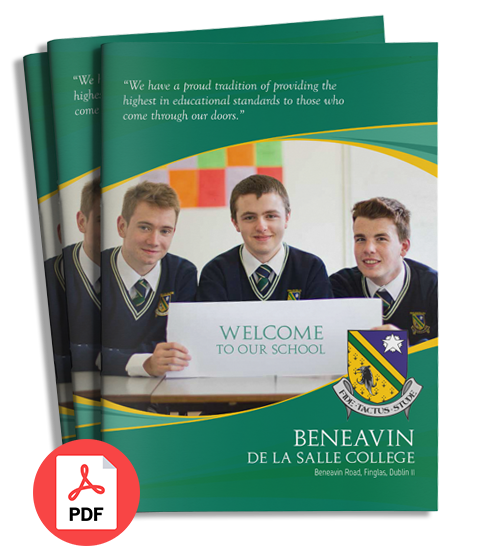 Like its sister communities Beneavin is a Christian school where people show care and respect for each other. Our dedicated teachers work together creatively and constructively to promote a school where integrity in the imparting of faith, learning and culture is vital. Our College is a focal point in the community. We are committed to education as a partnership involving links with parents/guardians, adult education and meaningful relationships with various organisations in the local community area. We provide our students with a wide curriculum choice and an enviable range of extra curricular activities. We care for our students, encourage them to realise their potential and give them the confidence and educational experience necessary for success. John Baptiste De La Salle, from whom our school derives its name, was born in 1651 of a wealthy family in Rheims, France. His father was a leading judge and his mother of the landed gentry. He was the eldest of ten children, four of whom died in infancy. From an early age he expressed an interest in the priesthood. However, while he was still in the seminary in Paris, both his parents died within a short time of each other. John Baptiste, being the eldest, decided to return home and take care of his brothers and sisters as well as the family business. He continued his priestly studies in Rheims and was ordained a priest in 1678. He was appointed chaplain to a local convent and was beginning to settle into the routine and lifestyle of a pious, zealous young priest. However, his life was soon turned completely on its head by a chance meeting with a man called Adrian Nyel one day, on the steps of the convent. Nyel had come to Rheims to open a school for poor boys and he invited De La Salle to assist him with his project. De La Salle was interested and provided accommodation for Nyel and his small band of unskilled schoolteachers. At that time, in France, education was available only to children of the wealthy who could afford to pay for it. Those who couldn’t were left to roam the streets. In order to provide the teachers with basic training De La Salle brought them to live with him in his own home in spite of fierce opposition from his family. He decided to do this as he was convinced that the teachers needed constant support and guidance. While Adrian Nyel was very enthusiastic and zealous, he tended to open schools and move on to another project. From then on De La Salle became completely immersed in assisting and directing the teachers in their work. He formed the little group of teachers into the religious community and gave them the name “Brothers“. In order to identify still more with them he renounced his prestigious title of Canon and distributed all wealth to feed the poor of Rheims when a severe famine came in the winter of 1683. It got to the point where De La Salle had to beg for the bread that he could no longer afford to buy. Often his work was on the verge of collapse, yet his strong faith and wonderful trust in God supported him and his little community through each hardship and crisis. At the time of his death in 1719 there were one hundred Brothers teaching in thirty schools throughout France. Since then the work begun by De La Salle has spread all over the world until today there are 914 Lasallian establishments , including Third Level Colleges and Universities, in 87 countries with 820,000 students being educated by 63,113 teachers. The Brothers have been associated with education in Ireland for more than a century and established Beneavin Lasallian Center in 1956. John Baptiste De La Salle was canonised in 1900 and in 1952 was named Patron Saint of all Teachers. Written by Brother Columba Gallagher, F.S.C.